As a part of its Silver Jubilee celebration, a Panel Discussion was held in the conference room of the school. 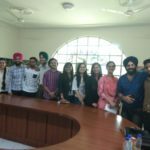 The agenda was to have an interactive session between the alumni and the current students regarding the various facets and features of the institution which have undergone significant changes over the years. The highlights of the discussion were the comparison between the State of Art Infrastructure of now and then which the school today feels immensely proud of,the plethora of new co-curricular activities and achievements in the field of sports, the transformation in pedagogy due to the concept of smart classrooms, various endeavours and ventures like the commencement of Sudoku classes, the Samaritan act of ‘Wall of Kindness’ the installation of a Solar Plant to mention a few. 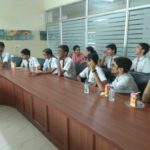 The current students’ curiosity got fully satiated as the alumni at length discussed each and every aspect related to their mother institution.Hilarious accounts of classroom anecdotes narrated by both the present and the former students regaled everyone present. The objective of the panel discussion was more than achieved when the alumni in unison exhibited their camaraderie, passion and dedication towards their Alma Mater and came up with innovative ideas for the future developments to help their school reach the acme of success. 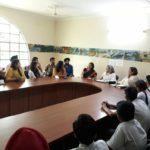 The event also witnessed the presence of Honorable Director, the Advisor, the Principal and the Head mistress of the school who applauded the effort of the alumni to spare their valuable time and giving commendable inputs thereby making it an amazing day for all. The Management appreciated the fact that the alumni have selected their Alma Mater as a school for their own words as well.